This page is in memory of Jim Rutherford. 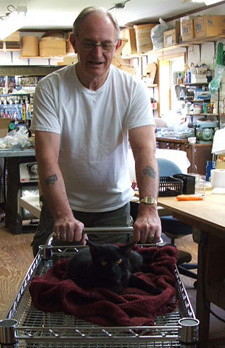 Jim would have wanted you to celebrate his life by making baskets, laughing, and enjoying friends. Jim passed away unexpectedly, of a heart attack on October 29th, 2005. Many of you knew him as a voice on the phone. Others knew him as a teacher or as the original editor of Basket Bits Magazine. For us, he was a co-worker and best friend for more than 20 years. We still miss him every day. 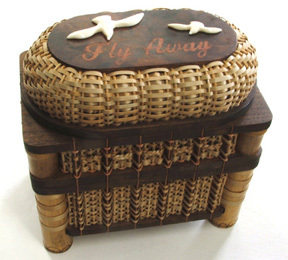 This basket was made by Jan Henry from Lithonia, Georgia, as a tribute to Jim. 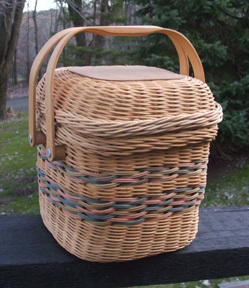 The basket won: "Best Art Piece" & "Viewer's Choice" awards at the 2008 Association of Michigan Basketmaker's Convention. 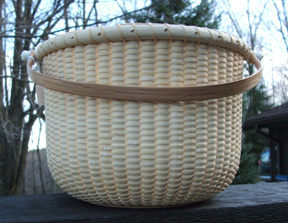 It was also exhibited at the North Carolina Basketmaker's Convention in March 2009. "Made of black walnut, cherry, white oak, ash, daffodil leaves, bamboo, and assorted “things” from Jim’s stash. 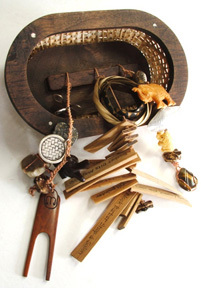 This memory basket was made of lots of material that Jim left behind when he died. Inside is a cascade of beads, polished stones, buttons, words that chronicle his life. The lower basket holds a booklet which tells of his life, what’s in the basket, and has pictures of him doing interesting thingslike riding elephants!" 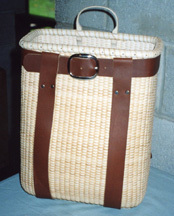 This is the Nantucket Backpack basket Jim was working on when he died. Bill has since finished it with "shoes" & a leather strap. Jim's Sister, Pat, is the proud owner. Jim was probably most known for his Nantucket Basket Classes. The "Pot Belly" shape was his favorite. He also taught the popular wood splint classes at many conventions. Beginning with the Fishing Creel. 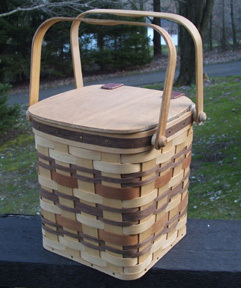 2-Pie Basket - ash, walnut, cherry splint, oak handles, plywood lid, leather hinges. 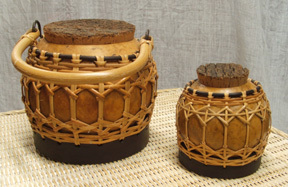 Early on, Jim fell in love with round reed and the wicker techniques. 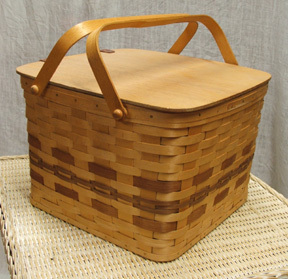 He first started teaching the round reed lunch and picnic baskets. 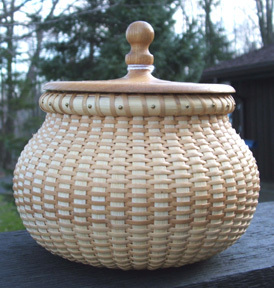 Round Reed Lunch Basket - round reed, oak handles, sassafrass wood bases. Jim also loved unusual designs such as the Ribbed Tray & the Chiang Mai Overlay, a technique he learned on a trip to Thailand. Jim spent some time exploring barks including hickory, poplar, and pine barks. 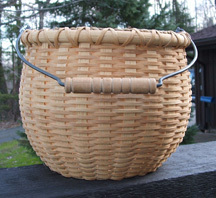 These baskets were made by Jim. They are 3 of his earlier baskets and are for sale. 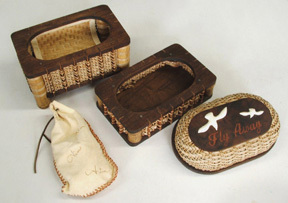 Jim's other baskets are in private collections around the country. Basket Pattern featured in the Summer 1989 issue of Basket Bits. This is Jim's Original Sample Basket. 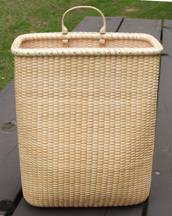 It is an older reed basket - from 1989 - has some damage to one side - broken weavers. Basket Pattern featured in an early issue of Basket Bits Magazine. This is Jim's Original Sample Basket. 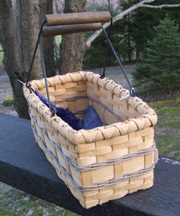 Jim made this basket back in the early 80's during a workshop. There is one broken weaver at the bottom, back.